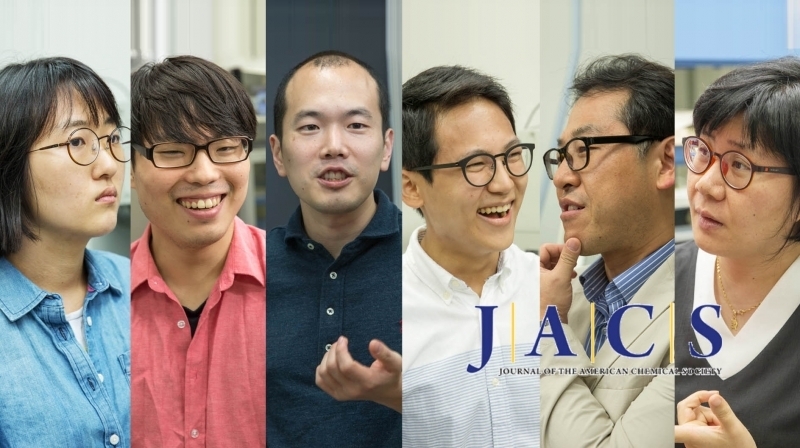 From left are Juhye Kang, Myeong-Gyuu Kang, Prof. Hyun-Woo Rhee, Jung Seung Nam, Prof. Tae-Hyuk Kwon, and Prof. Mi Hee Lim. Using red lights to target and kill cancer cells alternatively without surgery. The new study, by researchers from UNIST demonstrates a more holistic light-based treatment to nuke cancer cells instead of surgery. The results, reported in the September issue of the Journal of the American Chemical Society (JACS), could open up new avenues of research in cancer treatment. This research has been jointly conducted by Prof. Tae-Hyuk Kwon (School Natural Science), Prof. Mi Hee Lim (School of Natural Science), and Prof. Hyun-Woo Rhee (School of Natural Science), and eight other researchers at UNIST. 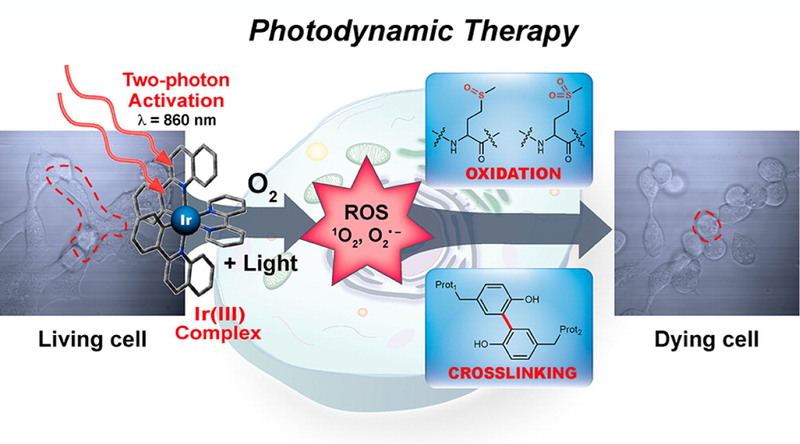 The study focuses on Iridium(III) complexes as promising novel agents for photodynamic therapy (PDT), a treatment that selectively wipes out cancerous cells without harming surrounding tissue. It also provides a careful analysis of reactive oxygen species (ROS) production process, as well as the therapeutic effects of specific wavelengths of different colors of light on cancer cells. It turns out that these Iridium(III)-based materials that utilize red lights attack the cancer cells more effectively and eventually lead to the cell death. Two types of protein modifications (protein oxidation and photo-cross-linking) involved in PDT were characterized by mass spectrometry. The PDT uses special drugs, called photosensitizers (PSs) in combination with harmless visible light to kill cancer cells. Upon activation by light, a PS produces a form of oxygen that display selective cancer cell killing behaviors. However, to date, the detailed mechanisms and direct involvement in PDT have not been revealed clearly. In the study, Prof. Kwon and his colleagues developed a number of PSs for PDT. The results show that red-light-absorbing PSs with longer wavelengths significantly accelerated ROS production compared to blue and green lights of shorter wavelengths. 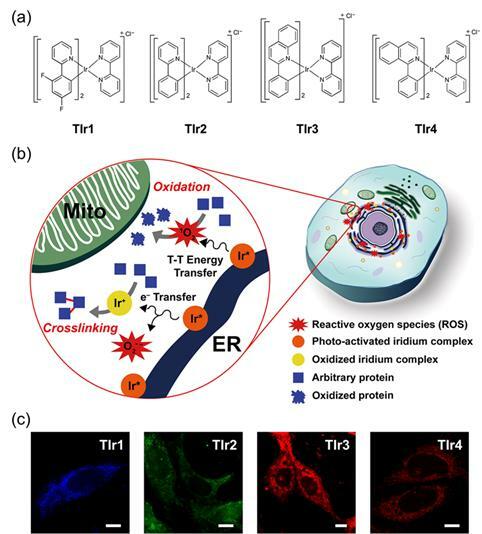 Protein modification pathways generated by Ir(III) complexes in cellular regions and optical imaging thereof. To further understand the exact mechanism of apoptotic cell death, the research team characterized the modes of action for Iridium(III) complexes for both protein cross-linking and protein oxidation, using mass spectrometry (MS). The team expects that their Iridium(III) complexes could be used for additive-free photo-cross-linking in other fields beyond PDT. With further research, this novel agents could conceivably used to treat a wide range of human cancers, researchers say. This study has been supported by the UNIST Alzheimer’s Disease research fund. Jung Seung Nam, Myeong-Gyuu Kang, Juhye Kang, Sun-Young Park, Shin Jung C. Lee, Hyun-Tak Kim, Jeong Kon Seo, Oh-Hoon Kwon, Mi Hee Lim, Hyun-Woo Rhee, and Tae-Hyuk Kwon, “Endoplasmic Reticulum-Localized Iridium(III) Complexes as Efficient Photodynamic Therapy Agents via Protein Modifications”, JACS, (2016).